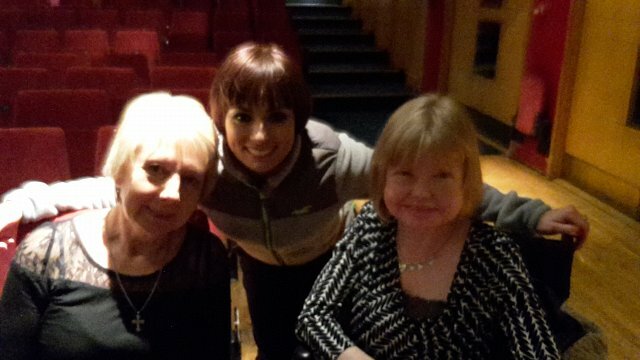 Sara is a Strictly Come Dancing fan and her ambassador Carol has already made her dreams come true by somehow managing to get Sara and her Mum tickets for the recording of Strictly’s Christmas Special. When we found out that Flavia and Vincent were performing “Dance til Dawn” locally in Southend we booked tickets for them straight away. Luckily for Sara, Rob, one of John and David’s friends is a professional musician and is touring with Flavia and Vincent. What a night Sara and her Mum had! An altogether fabulous evening – we couldn’t have had a more enjoyable night – thank you. The entire show was wonderful but watching Vincent and Flavia perform their signature dance live – the Argentine Tango – was quite simply the pinnacle. Meeting the pair of them was beyond anything I could ever imagined. They were lovely, both very down to earth. Vincent was characteristically amusing: joking about what a terrific dancer he was. Flavia was quite shy and very unassuming. They both thanked us for going!! I attach a photo for the scrapbook; hope you like it. Martin Hope (the Company Manager) very kindly took it for us. I intend to make lots of people green. It will serve as a very special momento of a very special evening. Living with Cystinosis can be tough but thanks to the amazing work of the Foundation, and yourself in particular, I have experienced some extraordinary days. There simply are no words to express the gratitude you are owed. PS: Rob Anstey (the very talented Bass player) also came and introduced himself. He too was lovely. He was obviously very familiar with the Foundation and says ‘Hello’ to everyone.